Door System - The Baut Studios, Inc. When Gene Baut figured out why the doors he was installing his artistic panels into were failing, he suggested a fix to the manufacturer. When he was politely told where to go, he went to the drawing board instead. 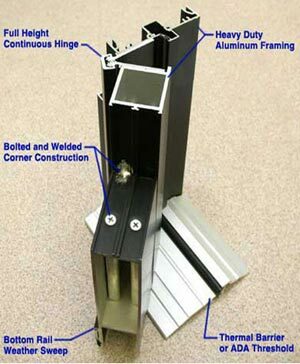 Why install your artistry in a lesser quality door? He decided to invest in designing his own dies for the extrusions, which was a big undertaking. He incorporated features that he thought were beneficial and would provide longevity to the product. All this culminated in Baut taking the plunge and manufacturing their own doors. Baut offers complete packages with all structural and decorative aspects handled by their in-house artists and engineers. Innovative product know-how, modern plant facilities, in-house design staff and computerized drafting, design and manufacturing helps Baut build the most intricate doors with ease. Baut doors have been installed worldwide successfully in cathedrals, churches, public buildings and schools by both Baut Studios craftsmen and local glaziers.